1. Box Hill and Leith Hill were removed from the route meaning no big hill climbs! At 0830 hrs I set off down the A13 in the driving rain. Cycling through the streets on London was great fun as there were no cars around! (all the streets on the route were closed off for the event). What struck me was the number of punctures I saw – I guess as a result of the wet weather and debris etc. By the time we got to Richmond park the rain was at it’s heaviest, with a few centimetres of water on the road. Worst was to come as a cycle-jam in the park meant we were stood on our bikes in the torrential rain for 30mins! (we learnt later that someone had fallen off their bike face first which had caused a long backlog of cyclists – I hope they were ok!). In the park I got chatting to a Geordie called Simon who was an amiable chap (and it turned out cycled at a similar pace to me)! We kept pace with each other for the last 60 miles! There were a few times when I was completely knackered so it was great to have someone to try to keep up with! The highlight (apart from finishing!) was seeing Matt and Chloe from MapAction on Wimbledon Hill cheering us on in the first moment of proper sunshine! After we finished, another downpour came and I went to meet my wife and daughter, before we caught up with Matt and Chloe and we met Ant and Luke too. And then the sun came out (as you can see!). Later on we were lucky enough to be invited to the H2 Bike Run Soho for a shower and massage (insert joke about a massage in Soho here!). After eating some delicious chicken jambalaya we each had a back or leg massage from the masseurs – which was fantastic! Thank you all! All in all it was a great day and I’d love to do it again. I just need to clear that with wife and daughter!…(oh and hope I get through the ballot next time!). 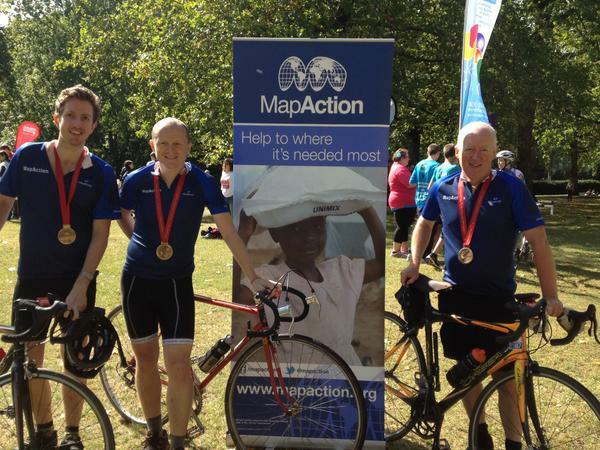 This Sunday myself, Luke and Ant are cycling the Prudential London-Surrey 100 for MapAction. MapAction is the disaster mapping charity which we three volunteer for*. MapAction respond to disasters worldwide and provide a common operational picture which helps bring resources to those who need them most. I’ve not had as much time recently to be able to help MapAction so was really happy to be one of those chosen to represent MapAction on the Ride 100. So, I’ve been trying to put in some training but kind of feel a little bit under-prepared! (I’ve managed a 30 mile, 70 mile and 40 mile ride in the last few weeks but would have liked to do more). What has helped me is the loan of my work-mate’s bike – thank you Paddy! This is a sportive/road bike which is 1 million times faster than my hybrid! It has clip in pedals and is nice and light too. In terms of nutrition I’m planning to take some Belvita breakfast biscuits (they seem to be working on my practice rides!) and jelly babies. And then there are all sorts of gels and things (but I’ve heard of the side-effects so I’ll probably steer clear of those!). All good bits of advice – apart from the slightly conflicting points 1 and 3. I hope that we all enjoy it and I’m sure we will. 24,000 people cycling on the car-free streets of London and Surrey sounds amazing! (I guess cycling in Scotland or Lancashire would be better but it’ll have to do!). So, 4 and a bit days to go!…..I’m getting a bit nervous!